A needle is my tool, thread is my medium and stitches are my marks. For over 40 years, I’ve created 3-dimensional hand stitched artwork that ranges from precious to poignant to provocative. 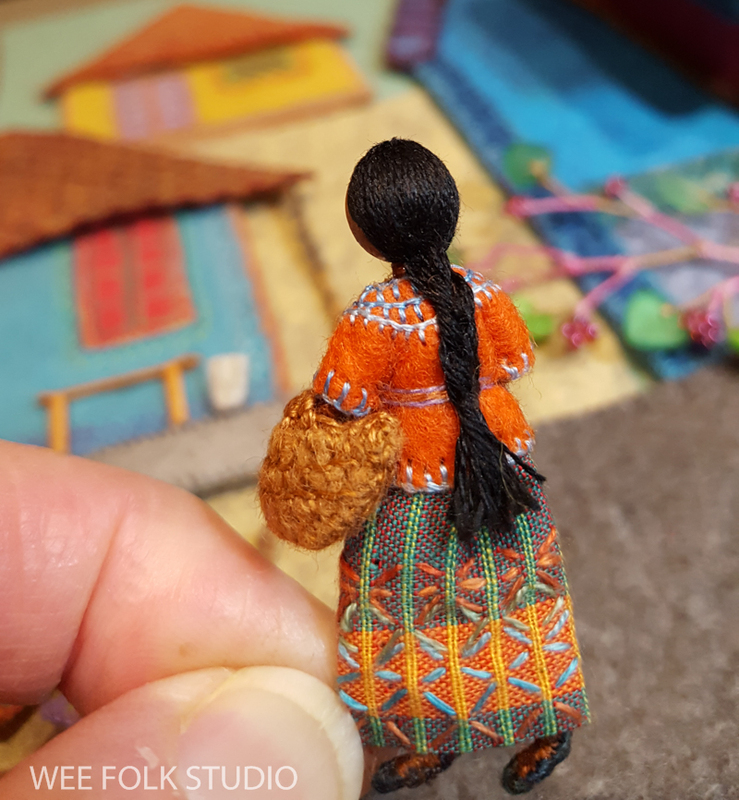 What I make and how I do it requires letting go of pre-conceived notions about fiber art, needlework, dolls, illustration and even political art. I rediscovered my childhood delight in sewing and creating miniature scenes while studying illustration at the Rhode Island School of Design. Manipulating materials in my hands with a needle and thread was so much more satisfying than rendering with a pencil or brush. I found that I could communicate my ideas more clearly and that my hands would direct me in a compelling way. For most of my career I have followed this path, creating narrative scenes in bas-relief, much like miniature, shallow stage sets, with figures imposed on embellished fabric backgrounds. My work is decorative and detailed, full of patterns from nature and found objects, all bound together with stitching. I am interested in universal, playful narratives that explore history, as well as reflect the society we live in today. Some of my original embroidered pieces are photographed and used to illustrate children’s books, including the 2010 award-winning Pocketful of Posies: A Treasury of Nursery Rhymes. The follow-up edition of my bestselling how-to book of doll projects, Felt Wee Folk: New Adventures was published in 2015. Books, cards and posters with printed reproductions of my embroidered scenes are available in my Etsy Shop. My new work moves away from the land of innocence and into real world issues and current events. I strive to find the beauty within the struggle and strife, as in my 2016 piece Displaced. Also, I formed a wee folk drama troupe, The Wee Folk Players (they’re a stitch) soon after the 2016 election and they’ve been performing political satire on this blog ever since. Most recently, my husband Rob and I made a short stop-motion animated film titled Liberty and Justice : A Cautionary Tale in the Land of the Free. My solo exhibit Liberty and Justice, which was abruptly cancelled due to its political content, has been generously picked up by 2 venues, the New England Quilt Museum in Lowell, MA (shown in the fall of 2018) and the Cotuit Center for the Arts in Cotuit, MA, March 2 – April 20, 2019. You can watch my interview about the show on WGBH TV here. I am currently working on a new picture book about where children sleep around the world, which is scheduled to be published by Houghton Mifflin Harcourt in 2020. You can see blog posts showing the book’s progress here. I live and work in my home studio on Cape Cod, in Falmouth, Massachusetts. For answers to frequently asked question, please go to the FAQ Page. Contact me via e-mail or write to P.O. Box 152, Woods Hole, MA 02543. Posters, cards and autographed books are available in my Etsy shop. Originals for sale: An exhibit of fabric relief illustrations from Pocketful of Posies toured the country for 5 years. Now that the traveling exhibit has come to an end, original embroidered artwork from the book is for sale. Please contact me for a list of available pieces. Each rhyme is displayed under Plexiglas in a custom-made cherry wood frame. Prices range from $2,500 to $6,500. Visit my Facebook Page. Follow me on Instagram. To find out about upcoming exhibits, talks and book signings, visit my Events Page. To see a list of all of my books, go to My Books. To find out about my foray into political satire, please read this interview. Read my post about artistic privacy and when to tell how and when not to. Watch WGBH OPEN STUDIO interview. Hear Abby Glassenberg’s podcast interview with Mimi Kirchner and me. Please note: Wee Folk Studio has discontinued the Blossom Fairy Kits. My Self Portrait: A Personal History of Fashion (pictured below) is on semi permanent display at the Woods Hole Public Library. I found this blog via Maya*made giveaway post and your work is wow! I cannot put my excitement into words and you’re so amazing! What are your hands made of? I love your work so much! I am new to crafting world and really thank you for sharing your story. I am so taken by your work! Last Saturday (Feb 5), I chanced upon your book while at Michael’s looking for some yarn. I put it back on the shelf but the images stayed with me so I wound up ordering your book from Amazon last night. 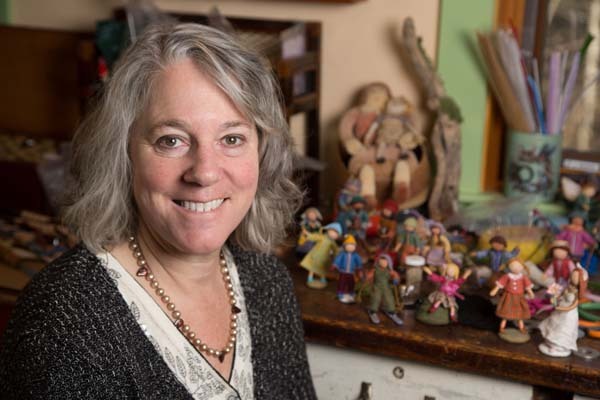 I’m an artist and a crafter and all my life, I’ve dabbled in doll-making (I cultivated a friendship with a doll maker from the Netherlands–Marleen Engeler when I was in my 30’s so we’ve been exchanging cards and mail for a good 20 years), I’ve loved miniatures and fairies and such. Somehow, painting them just didn’t do it for me. I think you’ve introduced me to an art form I’d like to try although I know I don’t have the patience it needs. Thank you for being an inspiration! I love art, and am so very impressed by you and your work. How wonderful to be able to read about the woman who is behind such exquisite work. Has anyone ever approached you with the suggestion that you design children’s clothes? The sweet simplicity, lines and nourishing colors that your little people wear would do so well on little people everywhere. May your heart and hands continue their magic for years to come. Hi Salley, your work is lovely! Keep it up. Wonderful. I recently found your book Pocketful of Posies and I love it so much! I enjoy working with felt, but most of my work has been 2 dimensional. Your book has inspired me try creating 3 dimensional characters. Your little people are so precious! Hi Salley, I discovered your site whilst looking for nut hutch information, I have a workshop next weekend on birds. What wonderful work you do, I love the birds! Do you make your own felt? What is matt board? I would love more information please! Outstanding! Found you thru a pinterest. Love your work. How fun it must be to live on the Cape. Became engaged on the Cape! Cheers! Hi Salley…name is Gina I am very interested in purchasing your “Blossom Fairies Kits”. Do you still sell these? I purchased a Miniature Collector Book at a Miniature show in Syracuse, N.Y. dated December 2000…..Booooo! I really really hope you have kits available I am so very excited about these. Hope to talk to you soon. I have admired your work since finding your Felt Wee Folk years back. 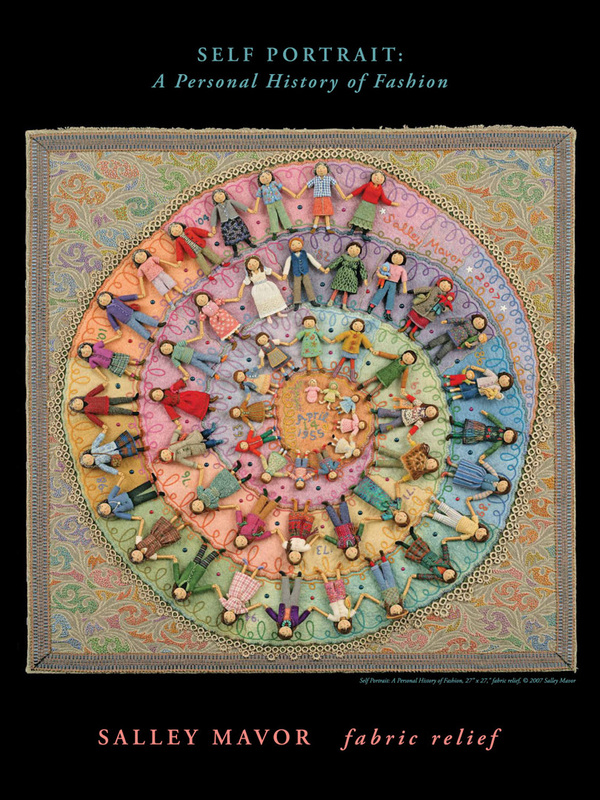 Saw your incredible piece in the LaConner show today with my quilting buddies and fellow admirers and was awestruck. My friend Linda summed it up when she said she never thought she’d be lucky enough to see your work in person. It made our day to say the least. So amazing. The attention to the tiniest detail is amazing and truly transports me. Thank you. Parabéns pelas obras que revelam uma grande sensibilidade artistica, primando pela perfeição e preciosismo. Obrigado por me conceder a honra de apreciar a sua ARTE. Certamente a mais bela arte que já vi! Encantadora! Um dos trabalhos mais lindos que eu já vi ( via internet ). perfeito e cheio de Amor! Oh, Salley, your works are a Fairy Tale World, where’s good to live! I came over from Stitching Fingers. Visiting your website really made my day!! You sent my mind on a fantastic journey. Thank you and keep up the good work! Happy New Year wishes from Germany. 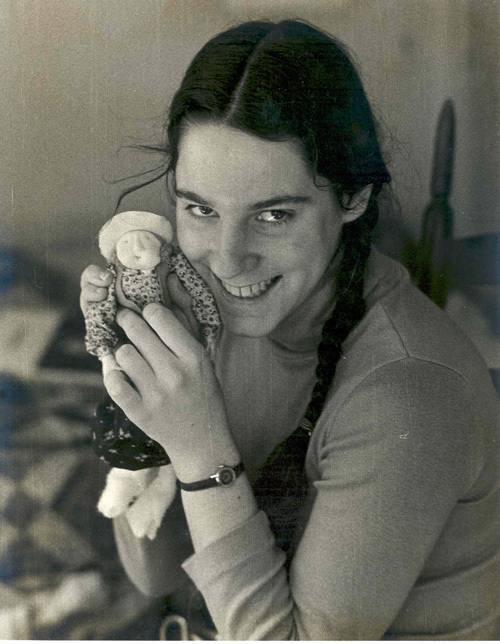 Your work takes me back to a time in my childhood when it was still possible to be an independent, imaginative child who roamed the neighborhood and woods with abandon. There is a magic in childhood and you capture it in the most enchanting manner with your beautiful works. You are singly responsible for inspiring my 17yr old daughter to sculpt and make unique dolls which she now also sells on Etsy. She always mentions how grateful she is to you for writing your books – you are her heroine! Hearing this makes me feel like it is all worth it! Your work is beautifull, we feel inspired, thank you for sharring it us. I saw the corner of your piece with the crewel work sheep on a number of craft a fiber boards on Pinterest but couldn’t find your site until I did an image search for “crewel sheep on felt blanket”… and found weefolkstudio.com. What beautiful work you do! Having no kids myself and with friends and family who all have grandsons, I’ve not seen or heard of your books. I’m very happy I finally found out who you are — that little, anonymous pin was driving me crazy! Thank you for persevering enough to find me! Welcome to my world. It’s stories like yours that have convinced me to recently start adding watermarks to my images so that they don’t get lost on the web. Your art is absolutely GORGEOUS! I have never seen anything like your work. I saw it on pinterest and had to investigate further. I Love crafting, sewing etc. Your birds are what caught my eye as I love birds. I definitely will follow you from now on. I saw your work today at the Lexington, Kentucky Public Library and I was simply gobsmacked! I kept saying to myself,”How does she do that?” I kept vascillating back and forth between, “That’s machine stitched,” to “No, that is hand stitched.” Needless to say, you do amazing work (I love, love, love the cats. I wish I could afford one of your pieces. Thank you for bringing joy into my life today. Just wanted to tell you again what a treat it was to meet you! I love your work and seeing the smiling faces that left your presentation was a fantastic tribute to you! Brava!! I didn’t want to dominate your time at your event but it was such fun to meet a like minded artist. Not too many of us especially working in fiber and especially in embroidery and stitching, at least in the DC area. This October I will be apart of a studio tour (very popular here) In my studio I will feature my efforts in – new term coming up here: Intimate Sculpture Stitching (…or something like that). If for any reason you find yourself in the DC area on the weekend of October 17th (http://www.greatfallsstudios.com/studiotour.php ) I would love to reciprocate the art and talk. I’m deeply impressed, such dedication, such eye for details that make the world more beautiful, a life long thread of art and love. Just to say that I am in love with your artwork! It makes me dream, its really beautiful! I found your book on Etsy and ordered it right away. I’m having a blast making your “wee folk”. I’m at a kind of crossworks in my life and your creating is filling my soul during this time of renewal. Thank you. Although I have stitched and sewn and knitted and loved little things all my life, it is now at the age of 41 that I’m starting to think seriously about illustrating books and so on with my creations. I have sought out a childhood inspiration/local artist who has agreed to mentor me, and I list you among my greatest inspirations. Watching the trailer above makes me want to pull out Wee Felt Folk and make MORE of your dolls (I have made many! ), and also inspires me to find or make the time (I’m a full time teacher and mother of four) to pursue my creative dreams. Thank you so much for the beauty you bring into the world with your fabric relief! Salley eu adorei conhecer o seu Blog e a sua arte. O seu trabalho é mágico e de uma beleza sem igual. Parabéns! Hi Sally, Peter and Cathy just shared your new work with videos. This is so exciting, and I look forward to seeing more. I really enjoyed the short intro about your work, ‘Rabbitat’, seeing this work develop, as you find inspiration in nature. All of this is lovely and inspiring. Thanks so much for creating your wonderful work and sharing it.